Former prime minister Ehud Olmert accuses Ehud Barak of torpedoing deal to free captured soldier Gilad Shalit. Former Prime Minister Ehud Olmert alleged in a bombshell interview on Thursday that then-Defense Minister Ehud Barak inadvertently scuttled a deal with Hamas to release captured soldier Gilad Shalit in 2008. Shalit was captured in 2006 in a Hamas attack. He was released in 2011, in exchange for over 1,000 convicted terrorists. 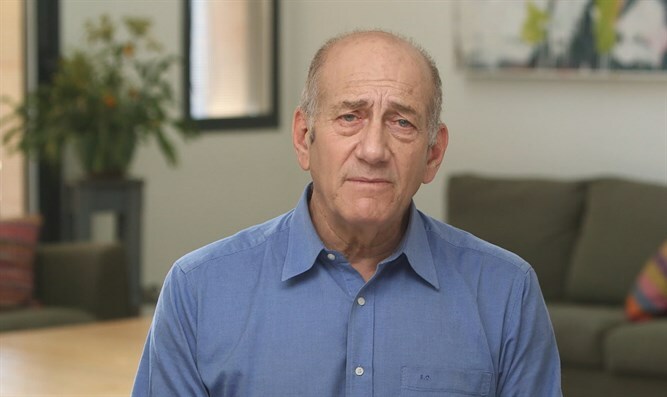 As part of the film Ehud Olmert - First Interview, set to be broadcast on Saturday night, the former prime minister recounted that Shin Bet head Yuval Diskin had managed to agree to a deal with the Hamas terror group that would have arranged for Shalit's release, only to have Hamas harden their demands after Barak paid a public visit to the Shalit family. "Just towards the end of my term, in the last few days we have received news that Hamas has decided to use the remaining days to close the Gilad Shalit's deal, and then we decided to send a delegation to conduct negotiations through Cairo," recounted Olmert. According to Olmert, the deal was so tangible that "the head of the Shin Bet, Yuval Diskin, who did not usually believe in the possibility of a deal until then but in this case, he said there is a chance". "In those days there was a protest tent run by the Shalit family... on that decisive day, Yuval Diskin is in Cairo and Ehud Barak goes to the Shalit tent, and then the Shin Bet calls me and says, 'We're not going to have a deal' continued Olmert. "He said, 'I have absolute knowledge that they said if Barak came to the protest tent, then Israel can be pressured, we will remain stubborn and we won't make the deal." When asked whether he blamed Barak for the deal falling through, Olmert responded that "I accuse him of irresponsible and reckless conduct that prevented the deal, and as a result of which two years later we released Hamas almost 1,100 of our most abominable murderers." Olmert's bombshell comes amidst of an interview blitz the former prime minister has gone on ahead of the launch of his new book. In excerpts published on Thursday in the Yediot Aharonot daily, Olmert said that Barak begged him to let him join his Kadima party after abandoning his bid to head the Labor party. "In advance of the 2006 election, Barak asked to join Kadima. He approached me, really begging that I include him on the list, even in the 20th spot. It was clear that he was looking for a new base from which to try to take off," wrote Olmert. "I considered his request, but it became clear to me that including him would hurt the new (Kadima) movement due to public opinion, which had not forgotten Barak's amazing failure as prime minister." Barak responded to allegations that he had asked to join Kadima by calling Olmert "a known liar with certification from the court" and saying that the |version of the incident is false and baseless". Olmert first became prime minister in 2006 after Ariel Sharon suffered a debilitating stroke and stayed in the post until he was felled by graft allegations in 2009. In March 2014, he was convicted of bribery and began serving a 19-month sentence in Maasiyahu Prison before being granted an early release in 2017 for health reasons. Earlier this month, State Prosecutor Shai Nitzan decided not to launch a criminal investigation in a case involving classified documents in Olmert's possession while in jail that talked about Israel's raid of the Syrian nuclear reactor in 2007.